Hell Week is an actual part of the Navy Seal training program to determine which potential candidates have what it takes to overcome the pain, physical endurance, sleep deprivation, cold and miserable weather to become Navy Seals. Instructors encourage candidates to “Ring the Bell” to end the pain and suffering. 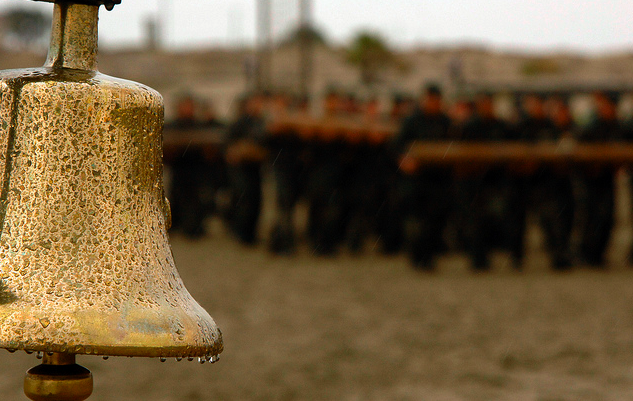 Ringing the bell is quitting – heading back to the barracks for a warm shower and hot meal. Unless you’re a Navy Seal in Hell Week – Life isn’t supposed to feel like Hell! If you are reading this right now and truly believe your life is HELL; I encourage you to Ring the Bell. Identify everything in your life YOU are unhappy with and decide you have had enough. Decide you have had enough and that you are not going to take it anymore. You deserve better, you deserve a wonderful life. A life you are excited about. Know you are making excuses for why your life is not going the way you want it to go. You are actually allowing all of these bad things into your life. Life is not supposed to feel like this. I have felt exactly like you are feeling right now. I was 70 lbs overweight, stuck in a unhappy marriage, commuting 4 hours everyday to end up totally broke and in debt. I decided to Ring the Bell! I’d had enough and knew changes needed to be made. I started exercising and lost 70 lbs. Applied for and achieved a better job. Increased my salary. Started spending less and climbed out of debt. My health improved and I felt great. All because I finally realised life is supposed to be filled with Joy and Happiness. If you are reading this and are struggling every day to wake up out of bed…Ring the Bell! A sales over-achiever who following a career set back went from unemployed to Director of Sales in 9 months. Leading up to the set back I had allowed stress, pressure and fatigue to over-take my health becoming overweight. I knew I needed to change. I started boxing, improved my diet, cut-out refined and added sugar resulting in a weight loss of 70 lbs. Now, I practice daily gratitude, mindfulness and leverage the Law of Attraction to bring Joy into the life of others. Sharing personal strategies to help people find Joy and Happiness in their lives.